We Need Your Input - How Can the U.S. Forest Service Help PFI Communicate the Benefits of Pellets & Bioenergy? Share Your Company's News on Pellet Wire! Don't forget to book your hotel room for the premiere domestic pellet fuels conference! We hope you will join us at the 2017 PFI Annual Conference in Stowe, Vermont, to network with friends and peers from the pellet fuels industry and learn about all the current market trends. 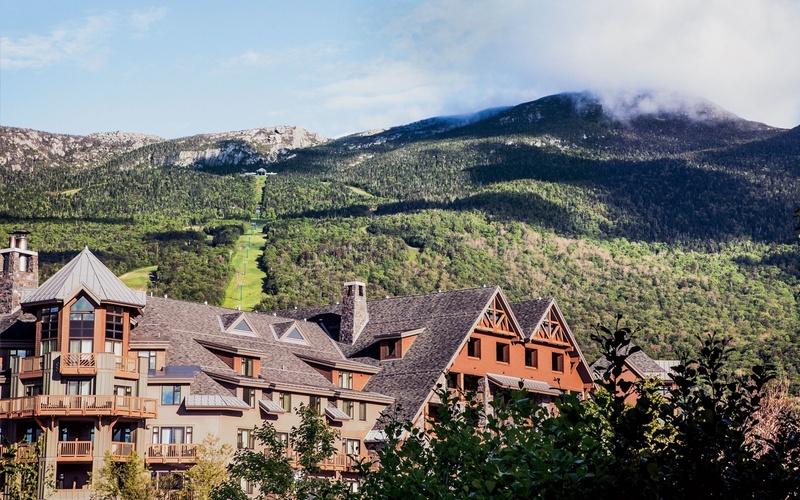 We will be opening conference registration soon, but in the meantime, book your hotel room with the Stowe Mountain Lodge! PFI has negotiated a conference rate with The Stowe Mountain Lodge for $259.00 (single/double). Contact the hotel directly to make your reservation at 888-478-6938 or online. Stowe has been a destination for world travelers for well over a century. The alpine style of the lodge reflects the beauty of the green mountains and rolling hills. Having opened in June 2008, Stowe Mountain Lodge sets a new standard of luxury and aesthetics for the East Coast's most magnificent resort. In conjunction with a dynamic conference program, you can visit some of the nearby sites like the Alchemist Brewery and some of the best shopping and dining Vermont has to offer. Combined with some of the area outdoor activities such as zip lining, biking, the PFI conference is a must-attend event. Take a look at all the great things Stowe has to offer. Stowe Mountain is a very popular destination and PFI is thrilled to host its 2017 annual conference at this first class property. Book your rooms now! Stay tuned for more information on conference registration. In the meantime, please contact [email protected] with any questions. Waste-to-Wisdom will be holding a one-day public workshop in Sacramento, California, on May 17, to talk about the advances being made in studying the conversion of forest residues for energy. Humboldt State University and its 15 regional partners - which include PFI, Lignetics and the U.S. Forest Service - will discuss new technologies and discoveries that will make wood-to-energy increasingly efficient and diversified. See innovative methods and tools used to convert forest residues into high quality biomass feedstock to specifications required by different biomass conversion technologies. Learn how we developed a model to optimize the selection of production pathways including collection, comminution, product upgrading (moisture control, densification, and in-woods biomass conversion), and transportation to maximize net revenue. Hear how we scaled-up the most promising prototype units for three biomass conversion technologies - biochar production system, torrefier, and briquetter - to sizes appropriate for achieving commercialization. Understand how we evaluated the economic feasibility, social impacts, and ecological sustainability of implementing the proposed conversion technologies in addition to a cradle-to-grave life cycle inventory for each of the individual systems. Participate in topic-based breakout discussions. Please visit the Waste-to-Wisdom website for the full agenda and registration. Waste to Wisdom is an innovative biomass research project led by Humboldt State University and 15 regional partners, who are building on existing research on the conversion of forest residues into renewable energy and other valuable bio-based products. Our goal is to make better use of forest residues wasted from timber harvests and thinning by using new equipment, operations, and technologies that can turn that biomass into valuable bioenergy and bio-based products. Today is the last day of the two-week Congressional recess. Members of Congress come back to town on Monday, where a vote is scheduled to confirm Gov. Sonny Perdue as the next Secretary of the U.S. Department of Agriculture. He is expected to win approval. This upcoming week is a big one, as Congress and the Administration must come together to approve a government funding measure that will keep the U.S. government operating past April 28-that is when the current funding authority expires. Indications are that Congressional leadership may take another run at repealing and replacing Obamacare, while the White House is pressing hard for funding a U.S./Mexico border wall. In the midst of this, PFI has been working hard with our colleagues in the forestry and forest products space to secure language as part of a spending package that would codify the concept of biomass carbon neutrality. The language is identical to that which was included in Interior appropriations bills that were pending last year. The provision would legally bind EPA not to regulate carbon emissions from biomass combustion as long as certain forest sustainability criteria are met. The pressure to enact a carbon neutral provision was relieved somewhat by the new Administration's approach to the Clean Power Plan. However, biomass energy continues to be attacked by environmental groups asserting that biomass energy is worse for the environment than energy derived from fossil fuels. For this reason and the fact that we need long-term certainty (beyond the Trump administration) on this critical issue, we are pursuing a legislative solution. The U.S. Forest Service Wood Energy Team is compiling a suite of materials to communicate the many benefits of wood energy. The materials, and accompanying communications outreach, will highlight the agency's supporting relationship with domestic pellet producers developed through our Memorandum of Understanding signed in 2013. The materials will be available for PFI and other MOU partners to use during discussions on Capitol Hill and with the media and other audiences. One of the team's first initiatives will be to develop a handout that illustrates the many jobs in the forest products sector that are supported by bioenergy - and the many additional rural jobs that could be created if the industry and the Forest Service are properly valued. As the Forest Service begins this project, members of the Wood Energy team are looking for input from PFI and other groups on what will help the industry communicate about wood energy. They have asked for input on data figures to explore, for instance statistics on how Forest Service dollars are spent to support bioenergy projects. We are looking for your ideas for handouts, data and other materials created by the U.S. Forest Service that will help us make our case. If you'd like to weigh in, please be in touch with Carrie Annand at [email protected]. Thanks to those who have provided suggestions! PFI invites you to become a 2017 sponsor! This year, we have developed a new, streamlined sponsorship program that will create multiple opportunities for your company in 2017. Your company will have great visibility at PFI events, on the PFI website, and in the PFI newsletter, amongst other benefits. PFI's membership includes over 100 member companies, and our electronic newsletter is sent to over 3,500 people every week. Now is the time to become a sponsor of this organization. Visit our website to explore how you can become involved. Follow and Connect With Us on Social Media! We urge all PFI members to engage with us on social media. By joining PFI in being visible and active on social media, we can make our voices heard more loudly and by many more audiences. Please be in touch with Carrie Annand at [email protected] with information on your company's growth, job openings, promotions or other news. We welcome and encourage all interested PFI members to get involved in our committees. There are many opportunities to help steer the association. No matter where your expertise and interests lie, we have a committee that will suit you. Help us plan our next conference, shape our policy agenda, lead communications outreach or grow the PFI Standards Program. Visit PFI's website for more information. It's great to talk about biomass as a renewable energy source, but how does it work in real-world situations? During last week's Alaska Wood Energy Conference in Ketchikan, participants heard three "case studies" from communities in Alaska that have invested in biomass. Galena is a small village about 300 miles west of Fairbanks. It gets cold there in the winter - like negative-40 cold - so heat is pretty important. Their big industry is education. Galena is home to a regional boarding school on the site of a former U.S. Air Force base. Tim Kalke is a teacher at that school, and worked on plans to improve the heating system for the 14-building Galena Interior Learning Academy. "Heat to these buildings was distributed through steam," he said. "They had several steam boilers that took the load. Very inefficient, and very old. Annual consumption of fuel for that system was about 230,000 gallons." Ketchikan hosted the annual Alaska Wood Energy Conference last week, where participants heard about how biomass works in different places, and how to make the technology more known, and eventually less expensive to install and operate. Biomass is ancient. Humans have been burning wood to produce heat and light for thousands of years; but new technology has turned that ancient energy source into low-emission fuel that fits nicely on the menu of renewable energy options. But unlike wind and solar, for example, biomass doesn't get a lot of policy perks, which has slowed its growth. That was a recurring theme of the 2017 wood energy conference - building policy. In his presentation, Chris Rose of the Renewable Energy Alaska Project spent some time making the case for biomass: energy demand is on the rise, fossil fuels will run out, and renewable energy is a fast-growing industry that the United States - and Alaska - shouldn't miss out on. Oregon Senate backs Woody Biomass as "Green Energy"
Oregon Senate Republicans say adding woody biomass as a recognized source of green energy technologies will help reduce carbon emissions and create jobs in rural Oregon. The proposal, Senate Bill 634, passed the Senate Thursday with unanimous bipartisan support. "We need to reimagine energy policy and modernize it so our regulations reflect it is 2017. We should be leveraging our current resources to achieve the greatest outcomes possible," said Senate Republican Deputy Leader Tim Knopp of Bend. "We can create tremendous impact in rural Oregon too by simply allowing developers to use renewable energy that includes woody biomass." Senate Bill 634 adds woody biomass as a fuel for space or water heating, or as a fuel for combined heat and power systems. According to the Oregon Energy Department, wood is still the largest biomass energy resource today. Oregon has 17 woody biomass power facilities, primarily in the wood products industry, and 21 other facilitie, including schools and hospitals, which use woody biomass to provide heat.